A design project goes through a number of time phases. 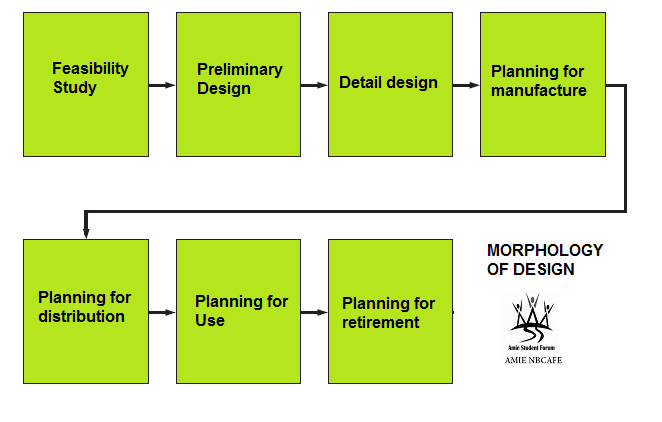 Morphology of design refers to the collection of these time phases. Morris Asimow was among the first to give a detailed description of the complete design process in what he called the morphology of design.The morphology of design as put forward by Morris Asimow can be elaborated as given below. It consists of seven phases. Search for a number of possible solutions with some basic questions. Evaluate the solutions of those questions. Is it within our financial capacity? Phase II. Preliminary (Embodiment) Design. * Study the advantages and disadvantages of different solutions. * Check for performance, quality strength, aesthetics etc. Its purpose is to furnish the complete engineering description of the tested product. In this phase the design is brought to the stage of a complete engineering description of a tested and producible product. Missing information is added on the arrangement, form, dimensions, tolerances, surface properties, materials, and manufacturing processes of each part. This results in a specification for each special-purpose part and for each standard part to be purchased from suppliers. Finally, complete prototype is tested. This phase includes all the production planning and control activities necessary for the manufacture of the product. A great deal of detailed planning must be done to provide for the production of the design. A method of manufacture must be established for each component in the system. As a usual fi rst step, a process sheet is created; it contains a sequential list of all manufacturing operations that must be performed on the component. Also, it specifies the form and condition of the material and the tooling and production machines that will be used. The information on the process sheet makes possible the estimation of the production cost of the component. 12 High costs may indicate the need for a change in material or a basic change in the design. Close interaction with manufacturing, industrial, materials, and mechanical engineers is important at this step. Preparation of process sheet, i.e. the document containing a sequential list of manufacturing processes. Specify the condition of row materials. Specify tools & machine requirements. Specify the requirement in the plant. Planning for information flow system etc. The economic success of a design depends on the skill exercised in marketing. Hence, this phase aims at planning an effective distribution system. Important technical and business decisions must be made to provide for the effective distribution to the consumer of the products that have been produced. In the strict realm of design, the shipping package may be critical. Concepts such as the shelf life of the product may also be critical and may need to be addressed in the earlier stages of the design process. A system of warehouses for distributing the product may have to be designed if none exists. The economic success of the design often depends on the skill exercised in marketing the product. If it is a consumer product, the sales effort is concentrated on advertising in print and video media, but highly technical products may require that the marketing step be a technical activity supported by specialised sales brochures, performance test data, and technically trained sales engineers. * Designing the packing of the product. * Planning effective and economic warehousing systems. * Designing the product for effective distribution in the prevailing conditions. The purpose of this phase is to incorporate in the design all necessary user- oriented features. The use of the product by the consumer is all-important, and considerations of how the consumer will react to the product pervade all steps of the design process. The following specific topics can be identified as being important user-oriented concerns in the design process: ease of maintenance, durability, reliability, product safety, convenience in use (human factors engineering), aesthetic appeal, and economy of operation. Obviously, these consumer-oriented issues must be considered in the design process at its very beginning. They are not issues to be treated as afterthoughts. * Design for product improvement on the basis of service data. Phase VII: Planning for Retirement. This is the phase that takes into account when the product has reached the end of useful life. The final step in the design process is the disposal of the product when it has reached the end of its useful life. Useful life may be determined by actual deterioration and wear to the point at which the design can no longer function, or it may be determined by technological obsolescence, in which a competing design performs the product’s functions either better or cheaper. In consumer products, it may come about through changes in fashion or taste. * Design to reduce the rate of obsolescence. * Examine service-terminated products to obtain useful information.